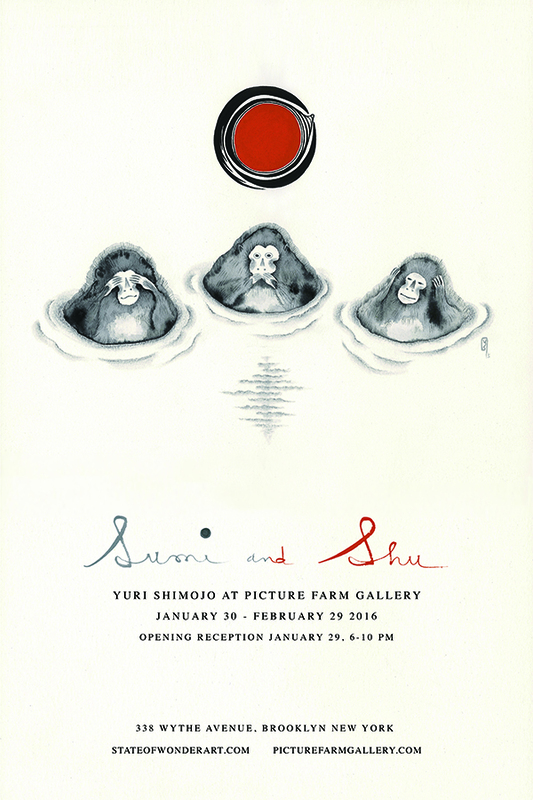 Picture Farm Gallery is looking forward to presenting to the public Yuri Shimojo and Sumi And Shu, a collection of paintings spanning 2000-2015. Currently working out of Kyoto, Ms. Shimojo still maintains a base in Williamsburg, the neighborhood in which she has lived for the last two decades. As an integral part of the expat artist and street art community, she returns to Brooklyn specifically for this show and to refresh Picture Farm’s front foyer mural for the new year. The exhibition will open on Friday January 29th, form 6-10pm and will run from the 30th of January until February 29th. “Yuri has been expressing her life through painting, journaling and dancing since she was 3 years old. Her upbringing in Tokyo was a very unconventional one – learning Japanese traditional arts and experiencing foreign culture through traveling abroad. These two elements, so drastically different, have influenced her work throughout her entire life. Now, living the nomadic bohemian lifestyle, she explores the planet from the heart of metropolis to the outposts of the world wherever being guided by her own intuition while hopping between her base pad Brooklyn studio, Tokyo apt and her tropical jungle hideaway in Hawaii. This life balances her creative & spiritual yin and yang’. Besides her artistic endeavor, she is drawn to the world of indigenous cultures and has led her studying universal shamanism as a Reiki master. She is also a member of the art collective Barnstormers. We look forward to seeing you at the opening. 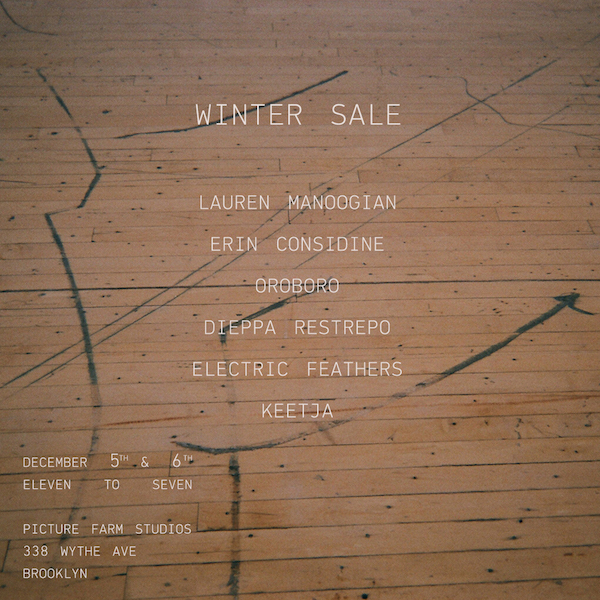 The Picture Farm Community Space is excited for Oroboro to host local fashion standouts Lauren Manoogian, Erin Considine, Dieppa Restrepo, Keetja and Electric Feathers for a trunk show, sample sale winter designer extravaganza. December 5th & 6th, 11 AM to 7 PM at PF Gallery.